I am often, actually almost always—overwhelmed. This probably has something to do with being an only parent, being an extremely detail-oriented person, and repeatedly making to-do lists that are entirely too long for one day. A few years ago, I decided to really examine where my time was spent. 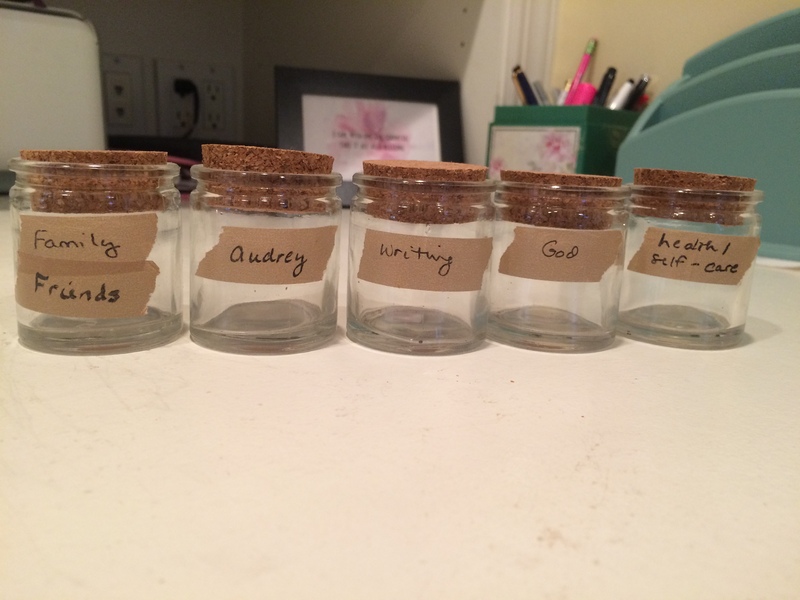 I knew what my priorities were, but I wasn’t sure I was spending my time accordingly, so I purchased the above tiny jars and labeled them. I thought that if I could place something small in each jar every time I had invested time in that priority, I’d have a visual at the end of the day to see if the way I spent my time was indeed matching up with my values. As is often the case with me, my execution of the idea never took place. It turned out though, that just having those little jars staring at me on my desk was enough for me to internalize them. “How we spend our days is, of course, how we spend our lives,” said Annie Dillard, and I started to think of each day as a tiny life unto itself. If I die later today, I’d think, would I be happy with how I’ve spent just “this day?” If what I value is getting out in nature, spending quality time with Audrey, writing—then if I’ve spent most of my day doing those things—and let’s say, not endlessly scrolling on FB—then I will be content. We’ve become accustomed to the huge successes and achievements people share on social media, but rather than pout because we haven’t made a tremendous social-media worthy “success” of ourselves, we can still focus on filling each “day-life” with goodness. “The most meaningful lives, I’ve learned, are often not the extraordinary ones. They’re the ordinary ones lived with dignity.” This is the epiphany in a NY Times op ed piece by Emily Esfahan Smith that I highly recommend you read in its entirety. Long-term goals are still important to me, but I focus more on living my tiny day-life the best way I know how, hopefully—with dignity. It sounds simple enough—but many of us get lost in the busyness of life and end up just reacting, or even just surviving. Living in day-lives means slowing down and being intentional about your small actions throughout the day. In the book Tuesdays with Morrie, Morrie, who is dying, suggests this: “Do what the Buddhists do. Every day, have a little bird on your shoulder that asks, “Is today the day? Am I ready? Am I doing all I need to do? Am I being the person I want to be?” I think when you lose someone close to you suddenly, that bird comes to live on your shoulder and never leaves. You understand in a way that many do not yet that tomorrow is not promised. There’s always the possibility that those long-term plans and goals you’re striving for will not have the chance to materialize—but—you have this one day. How do you try to live intentionally and spend your time wisely? Oh, this is such a good piece. I love the thought of tiny day lives. Thank you for sharing your thoughts. You write beautifully. It always makes my day better when I see you have written a new post. I will be thinking about my own day and how I can make it more meaningful, instead of just the blur that it often is. Thank you Linda. It’s always a real struggle for me to believe I have anything to say worth saying, so that means a lot. Wishing you many meaning-filled days. “What God may hereafter require of you, you must not give yourself the least trouble about. Everything he gives you to do, you must do as well as ever you can. That is the best possible preparation for what he may want you to do next. So good to hear from you Dorcas! I love George MacDonald. I hope you and the kids are well. Thanks Julia for this important and beautiful reminder! Love the quote by Emily E Smith…”living ordinary lives with dignity”. It makes me think of Jesus’ words of being faithful in small things. As a parent of young children, it is so easy for me to feel stressed and react, feeling lost in the mundane of our days. But how comforting it is to know that even a small act like reading a book and cuddling together could communicate love to a child’s day/life. I’d been wondering about you. I hope things are better now? Feel free to email me. Glad to hear from you again. Your words always touch me Julia. Thank you! I’m still trying to figure out what to do for “me.” Sometimes just sitting for a few minutes without any interruptions helps my mindset. Snuggling and watching a funny show with the kids allows my mind to be free for a bit too. You’re 100% right, being an only parent is hard but I think we as moms are doing the best we can and somehow our children understand us when we’re stressed and overwhelmed. Thank God for them. Sending hugs!